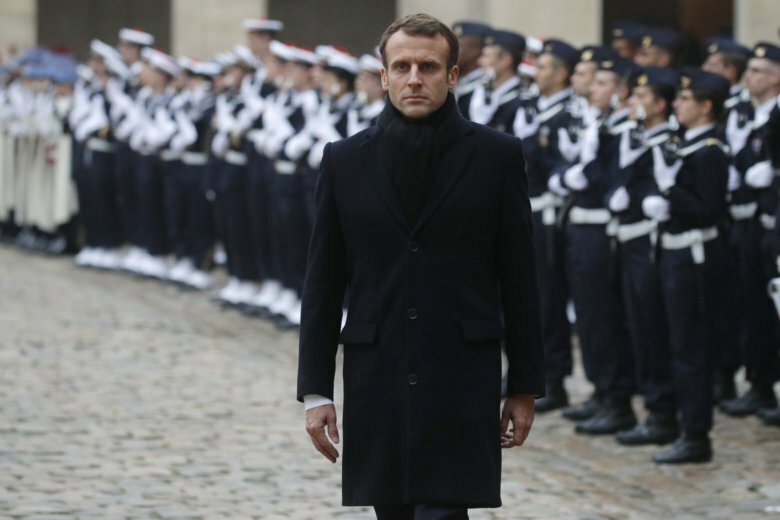 PARIS (AP) — French President Emmanuel Macron is trying to defuse protests over rising fuel taxes by explaining his plans to wean the country off fossil fuels and promising to shift out of cheap nuclear energy more slowly. After days of sometimes violent protests over high energy prices, Macron stuck to the small tax increases on gasoline and fuel that had prompted the popular anger. But he proposed a mechanism to regularly review the tax when global oil prices are rising. “I have a deep understanding of the expectations and frustrations, the resentment of citizens … Our duty is to bring a response,” Macron said in a speech at the presidential palace. Macron insisted he will show “no weakness” toward troublemakers who used the protests to damage businesses and clash with police — including in the heart of Paris, on the famous Champs-Elysees avenue. “I don’t confuse thugs with fellow citizens who want to send out a message. I feel understanding for these fellow citizens but I will not indulge those who want destruction and disorder,” he said. Outlining France’s energy strategy for the next 30 years, Macron said the government will by 2035 shut down 14 nuclear reactors out of the 58 now running at 19 plants. Yet he said France would cap the amount of electricity it derives from nuclear plants at 50 percent by 2035. That is a delay compared with the goal of 2025 set by his predecessor, Francois Hollande. France depends more on nuclear energy than any other country, getting about three-quarters of its electricity from the plants. The delay on the cap would in theory help move France from fossil fuels, which Macron wants to do to fight global warming, and toward renewables without increasing the price of energy too much. Germany saw an increase in energy prices after it started a big push from nuclear to renewable energy. Macron confirmed the first nuclear reactors to close will be those of Fessenheim, on the border with Germany, in a process that will start by 2020. Germany has long called for the plant to be shut down. The state government of Baden-Wuerttemberg, on the German side of the Rhine river that separates the countries, has warned that if there were a large-scale incident at France’s oldest still operating nuclear plant it would be forced to evacuate the nearby city of Freiburg. In an attempt to calm protesters in France, Macron also proposed a three-month consultation with associations and activist groups, including the so-called “yellow jackets” who have led the recent protests, about how best to handle the rising energy costs. Environment minister Francois de Rugy will meet with some of the “yellow jackets” leaders later on Macron’s request, the president’s office said. AP writer Frank Jordan in Berlin contributed.